Dimensions 0 by 10.50 by 9.50 in. Amazon.com description: Product Description: Here is a timely tale of a mouse who thinks heâs a lot braver and better than anyone around him.Â Undaunted by extreme heights, wild animals, or angry birds, this mouse is determined to conquer every obstacle in his path. He climbs, dives, and does all that he can to prove how brave he is. "I am the mountain mouse!" he shouts when he summits his first not-quite-mountain. And this is usually the warning for his minions to take cover . . . because what they see and what Mountain Mouse sees are never quite the same! 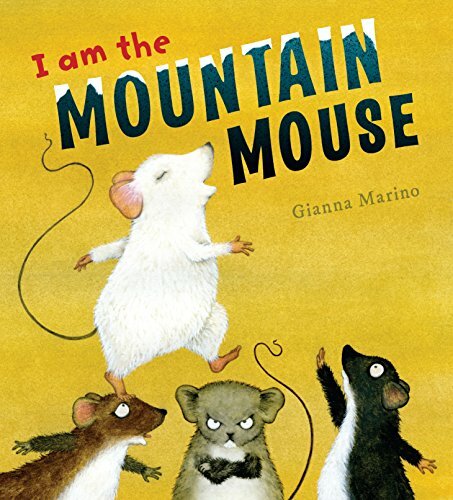 Full of slapstick silliness and adventurous antics, I Am the Mountain Mouse points out how ridiculous a big ego can be . . . in a quite deliciously over-the-top way! About: Here is a timely tale of a mouse who thinks he’s a lot braver and better than anyone around him.